T Marcus Cannon vs. 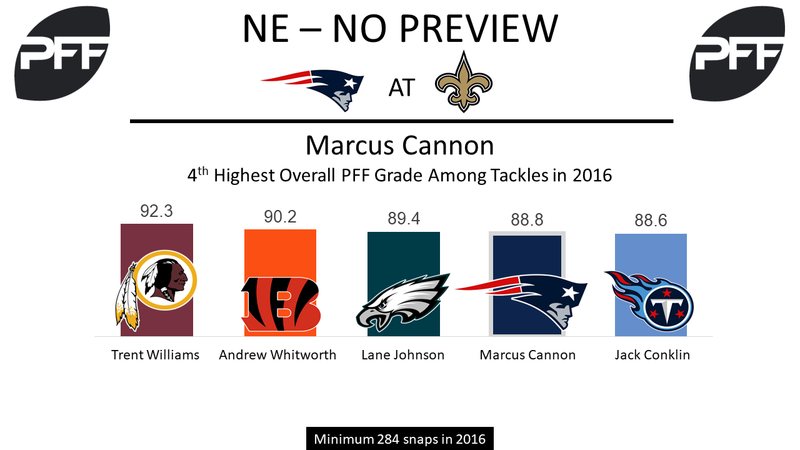 EDGE Cameron Jordan – After an excellent 2016 season that earned him an 88.8 overall grade, Marcus Cannon struggled in Week 1 in his matchup against Justin Houston, earning a 41.6 overall grade for the game. His Week 2 assignment doesn’t get any easier, as he’ll match up with Cameron Jordan. Jordan was dominant in 2016 to the tune of a 92.5 overall grade, third best among edge defenders. He earned an 89.3 overall grade in last week’s game, with a sack, a hit, and a hurry to go along with 2 run stops. WR Brandin Cooks vs. CB P.J. Williams – Brandin Cooks was New England’s highest graded receiver in Week 1 at 75.2 overall. He was targeted deep twice, converting the only catchable pass of the two into a 54-yard gain. Cooks will still spend most of his snaps at left wide receiver, but he should have some snaps in the slot, and he’ll look to make the most out of his coverage by P.J. Williams there. Williams graded out to 41.7 overall last week, and allowed 3.06 yards per cover snap, the most among 91 cornerbacks with at least 13 snaps. Cooks has a significant speed advantage in this matchup, with his 4.33 40-yard dash against Williams’ 4.57, and Cooks has done quite well in similar situations thus far in his career. TE Rob Gronkowski vs. S Kenny Vaccaro – Rob Gronkowski had a good game overall against the Chiefs last week, grading out to 75.1, but his 2 receptions for 33 yards were well below expectations. The Chiefs often slowed down his routes with chips from multiple players before he even reached the blanketing coverage of Eric Berry. Against the Saints, Gronkowski will look to get back on track, and he should be able to take advantage when matched up with safety Kenny Vaccaro. Vaccaro earned a 79.6 coverage grade in 2016, but struggled in Week 1, grading out to 30.3 for the game, tied for the third lowest grade among 74 qualified safeties. He allowed all five of his targets to be caught against the Vikings for 82 yards and two touchdowns. 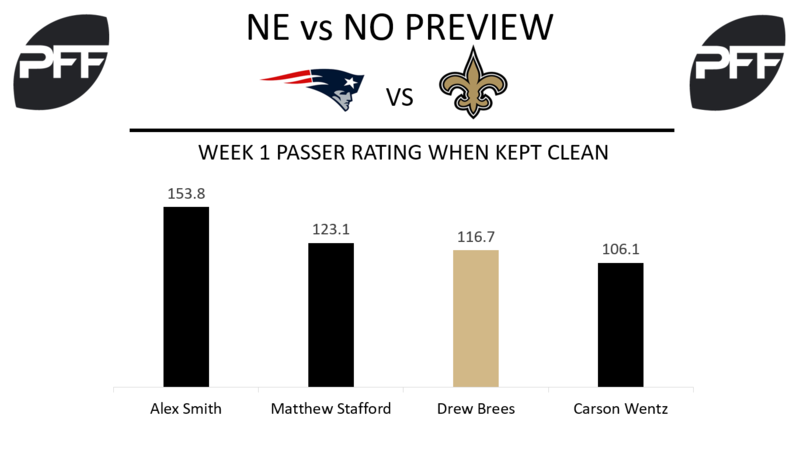 QB Drew Brees vs. the Patriots 3-man pass-rush – The Patriots enjoy taking away the quick passing game from their opponents, and they do so primarily through rushing only three players at the quarterback. They had the highest percentage of utilizing three-man rushes in the NFL last year, calling them at a rate of 26 percent, and they continued to call them this year against the Chiefs. It’ll be up to Brees to figure out where to go with the ball with eight defenders in coverage, but it helps that he’s one of the best quarterbacks in the NFL when he’s not pressured. In 2016, his passer rating when kept clean was 108.3, which ranked sixth. In Week 1 he had similar results with a passer rating of 116.7, which ranked third. RB Mark Ingram vs. EDGE Cassius Marsh – When the Saints needed to move the ball in the fourth quarter, Brees regularly found Ingram through the air. Ingram was quite an effective receiver, averaging 3.18 yards per route run, which ranked sixth in the NFL last week. This appears a mismatch if New England continues to have Marsh in pass coverage. On nine pass coverage snaps last week, Marsh allowed both of the targets against him to be caught to the tune of 89 yards and a touchdown, leaving him with a perfect 158.3 passer rating against. His 29.9 coverage grade registered as the worst among EDGE defenders who received coverage grades last week. WR Michael Thomas vs. CBs Malcolm Butler and Stephon Gilmore – Butler and Gilmore both played 31 coverage snaps as the outside cornerbacks (out of 39 and 40 total coverage snaps, respectively). Out of 59 total snaps at receiver last week, Thomas played 51 of them as the outside wide receiver to either side. To win this battle of strength-on-strength, the Saints should turn to the slant. Last week, Thomas had a 118.8 passer rating generated when he was targeted on slant patterns, over 22 points higher than the NFL average.